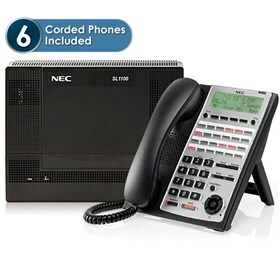 This NEC SL1100 IP Quick-Start Kit with 24-Button Telephones (1100013) offers everything you need to manage the day-to-day operations of your small business. The main SL1100 Key Service Unit (1100010) has 8 Digital and 4 Analog line ports with expansion capabilities. It also features an ethernet port, 4 mobile extension ports, and 32 conference channel resources. The NEC 16-Channel VoIP Daughter Board (1100111) is a 16-Channel VoIP Daughter Board that provides 16 VoIP channels. It is equipped with 8-conductor jacks and ferrite core and is required for IP telephones & IP trunks. This daughter board can be expanded up to 32 VoIP channels with the 16-Channel VoIP Resource License and installs in a dedicated slot on the CPU-B1 board. The NEC 24-Button IP Telephone (1100161) is an IP telephone. It has 9 fixed feature keys and navigation keys with programmable LED keys. The 24 button telephone has these unique features include energy saving sleep mode, dual-color call indicator lamp, built-in wall mounting, and an innovative two position angle adjustment. The full duplex speakerphone gives clear sound for handsfree usage. It is equipped with (2) RJ45 jacks for LAN and PC connections. The telephone do not require a SIP Station License. The NEC 1100013 has many exciting features for users of all types. The NEC 1100013 is sold as a Brand New Unopened Item.